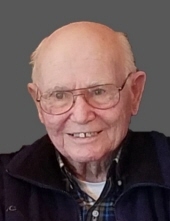 James Arnold Johnston, age 86, of rural Boone, passed away on Thursday, January 31, 2019 at Households of Bethany in Story City. Friends may call at North Grand Christian Church from 1 – 3:00 PM on Sunday, February 3, 2019. Funeral Service will be held at 11:00 AM on Monday, February 4, 2019 at North Grand Christian Church, 919 30th St., Ames, IA. Internment will be held at a later date at South Marion Cemetery near Stratford, IA. Jim was born February 26, 1932 in Des Moines, Iowa to Earl & Gladys (Gardner) Johnston. He achieved the rank of Eagle Scout and graduated from Winterset High School in 1950. After High School he enrolled at Iowa State College in Ames where he worked his way through school. While in Ames, he met and married the love of his life Joann Carlson. They were married on June 13, 1954 after Jim received his degree in Animal Science. They moved to Lawton, Oklahoma for Army basic training then to Fort Knox, Kentucky. After serving he returned to college for his second degree in Agricultural Education. Jim spent his working life as a teacher, farmer, and a farm business consultant. He started Johnston Farm Business Consulting in 1976 working with family farm corporations. He continued in this line of work for 35 years retiring at age 79. Jim loved the Lord and served his church for many years. He enjoyed, music, travel, poetry, and people. His wife and family were his treasures. Jim followed the commandment to “Love Your Neighbor as Yourself”. He was always willing to help someone in need. Jim is survived by his wife Joann of Boone, his children, William (Colette) Johnston of Stanhope, IA, Barbara (Edward) Roberts of Elkader, IA, Sandra (Mark) Mueller of Solon, IA, and Steven (Sara) Johnston of Pella, IA. Grandchildren: Nathan (Alison), Matthew (Jillian), Melinda Johnston; Laura, Rebecca, and Charles Roberts; Parker and Jackson Mueller; Mason, Marissa, and Evan Johnston. Great Granddaughter: Lucy Johnston. His brother Donald (Virginia) Johnston of Canyon, Texas. Jim was preceded in death by his parents and infant daughter Debra Sue. Jim loved music. Memorials can be directed to the family for distribution to high school music programs. Funeral arrangements are under the direction of the Adams Funeral Home and online condolences may be left for the family at www.adamssoderstrum.com. To send flowers or a remembrance gift to the family of James Johnston, please visit our Tribute Store. "Email Address" would like to share the life celebration of James Johnston. Click on the "link" to go to share a favorite memory or leave a condolence message for the family.